And the list could go on and on. But one thing that it is not generally known for is uniformity. During the historic week of June 4 – 8, 2007, however, this was all to change – if only for a moment. 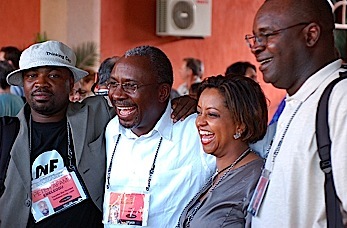 That's because this was the week that TED Global 2007 convened in Arusha, Tanzania. This was the week that the African blogosphere and its friends made their voices known to the world. Bloggers whose writings normally cover a cornucopia of topics, ranging from social and cultural issues to technology and economic concerns, were suddenly focused on TED. 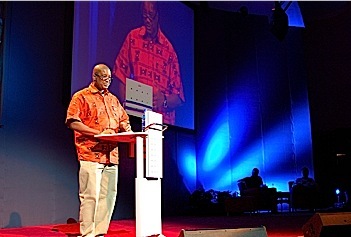 He stated the reasons for what he believes Africa has been left behind. His theory is that there are “hunted” and “hunter” nations. Some countries are positioned as places to go and grow businesses, others are positioned as the places to go and take resources from. Herman Chinery-Hesse at TED Global. Photo by whiteafrican. As I sit here a number of fellows have already emailed me, energized and ready to continue the dialogue and the plans of action from where we left off. I have added all my contacts to my addressbook and will spend the best part of this weekend replying and doing the same. On the agenda for the next year are possible trips to Nigeria, South Africa and Kenya. (I will definitely be back in Tanzania soon as well). The vibrancy and expectations of so many contacts I have met show me that many African countries are on the tipping point of something great, and it is an honour and privilege to know that I will be part of this magnificent journey of change, teaching and learning with new formed partnerships. I will be highlighting a number of the initiatives and people I have met on this conference on my blog (yeah I know I have a few) Simphani which focuses on stories of life, health and wealth from across the Diaspora. A group of TED Global attendees poses for a photo. Photo by whiteafrican. They took the West's gaze, and killed it, stomped on it, mocked it, burned its effigy (Joseph Conrad to be precise) so that we could start an entirely new conversation using an entirely different vocabulary. We killed famine, death, hopelessness, hunger, tragedy, poverty and started using words like potential, opportunity, wealth, entrepreneurship, ingenuity, art, imagination, creativity, success, investment, growth, choice. These are words the media use liberally when writing about emerging nations like India, China or Brazil, but not to describe some of the fastest-growing economies in the world when they happen to be in Africa. 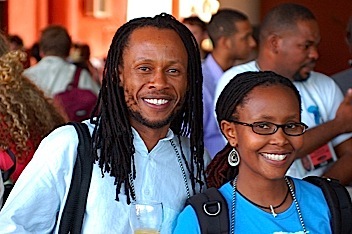 Global Voices’ Sub-Saharan Africa editor Ndesanjo Macha and blogger Afromusing. Photo by whiteafrican. For english speakers, read Ethan Zuckerman, the god/budha of liveblogging. Made it in one piece. Baby KP was perfect…she already has the makings of a sophisticated traveller :-) , which is a good thing seeing that mama has a bit of wanderlust in her. 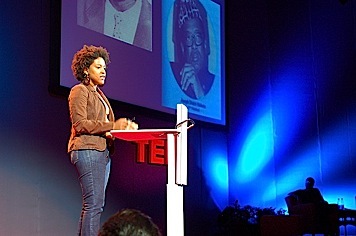 Ory Okolloh at TED Global. Photo by whiteafrican. No place in the world has ever grown a market sector on the type of risk that Africa’s farmers face. Forget making poverty history. I want to make Africans rich. Idris Mohammed believes that we should be talking about increasing wealth not reducing poverty. I call it the African shuffle. Idris Mohammed describes yet another graph that shows stagnant economic growth in parts of Africa where instead of rising the graph remains a flat line. Dignity is more important that wealth. Understand the power of patient capital. Jacqueline Novogratz explains that taking time to engage with the communities you invest in helps the money do more. 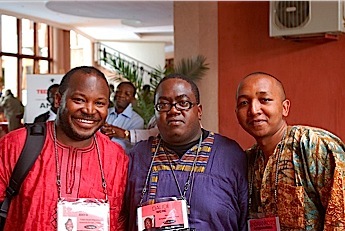 Mental Acrobatics (centre), Harinjaka (R) and a Nigerian colleague at TED Global. Photo by whiteafrican. The “Mac or PC?” question was asked to all the fellows during the last breakfast at TEDglobal2007. Looks like they’ve been listening as Google and AMD have decided to give each of the 100 TED Fellows a bradnspanking new notebook. The only thing we have to decide is Mac or PC. I have to wonder though, will it not be easier to source local Laptop suppliers in the TED Fellows countries with vaious keyboard, language and power requirements? Not to mention technical support? Unless… the noteboks will be those supplied by a manufacturer that already offer support in the countries the TED fellows are making a difference in? Conferences like TED Global are only a couple of days long, but I find I can get surprisingly used to them – wake up, absorb a mass of new and provocative ideas, have a few dozen conversations, stagger back to the hotel, rinse and repeat. And then, all of a sudden, they’re over. It was almost humorous how quickly TED ended – Minister Okonjo-Iweala left the stage at 1pm, and half an hour later, many of the participants were on buses heading to basecamp to climb Kilimnanjaro. Bankelele is one of the foremost bloggers in Kenya, and one of the things that makes him such a force to reckon with is the fact that he's a banker in real life and does not mince words. He dispenses industry-specific knowledge on banking in Kenya, as well as on the state of Kenya's economy. In this post, he compares his experience at TED to the excitement he felt during some of the world's most memorable sporting moments. Mentioned earlier about being blessed/fortunate in life to see people like Michael Jordan (destroy Washington in their last game as the Bullets, though Scottie Pippen provided the winning dunk), Michael Schumacher (win the first US grand prix) and Tiger Woods (not enjoying his first US open). That all compares with being at TED Global in Arusha at which Kenya is well represented. Florence Seriki: An African woman in computing. Omatek is the first African computing company. She switched from Chemical engineering to computing where she started by selling hardware and training professionals in Nigeria. Keep doing what you are doing she says. In 1988 Omatek was incorporated and soon her company became a premier partner with Compaq and IBM [>$7mil in sales]. In 1991, she visited Asia she saw the supply chain and noticed the Chinese tech was developed in house. Wassup y’all. I’m BACK! Here on my first overseas trip of 2007. Yes, I’ve been keeping a low profile plotting ye’ ole’ renaissance, from my new digs in N. Hollywood CA! Loads of stuff has happened since I flipped to the West Side. Honestly I’m not even sure where to begin breaking it all down for y’all. But suffice it to say it’s been off the hook. But to bring it back to the present, today is my first day at the TED Global Conference being held here in Arusha, Tanzania. ‘Tis the first time TED has come to Africa and I am straight up meeting the most AMAZING people every few minutes. It’s almost like a brain overload kid. I already have a bunch of folks to followup w/ and some potential collaborators and I haven’t been here 24hrs yet. Before going to TED Global, I kept hearing voices blaming governments for not doing this and that plus several other reasons why African countries cannot prosper unless some one from outside Africa does something. At TED however, everyone I met was determined to solve Africa's problems without waiting for governments or donors. So I've come back energised and connected to the right community that will hopefully keep me motivated. Help us to provide an exposure of the Madagascar situation. Madagascar is an island located off the eastern coast of southern Africa in the Indian Ocean. As the world’s fourth largest island. Madagascar has been isolated from Africa for over 150 million years. For this reason, most of the plants and animals found on the island exist nowhere else on Earth. Malagasy is the name for the people of the island and the national language is the Malagasy language. The US and UK could not have been built without Africa’s Aid. When you situation is dire, and personal, you don’t care if it’s aid money or where the money comes from. Spain received $10 million in aid from the European Union. Ireland received $3 million in aid, and is now one of the fastest growing economies in Europe. Neither of these countries felt guilty or bad in any way receiving this money. A new set of aid entrepreneurs are emerging in the individuals who founded very wealthy foundations. They may take over from the aid received from governments one day. The question is open as to how interested they really are in helping Africa. Are they listening? Are invited to serve on their boards to help with making decisions? The answer is no! Emeka put it well when he summarized the conference and said “what we have done at this event is plant seeds.” Indeed the seeds of change, progress, and a new African renaissance have been planted! Well, as much as I wanted to continue with this post, it had to come to an end. It took me quite a while to locate some of these posts (roughly four days) not to mention that I don't want to lose anyone's attention. Hopefully this piece does enough to convey the sense of “something really major” coming out of Africa, that oozed from the keyboards of everyone I've come across who attended the event. Also, please note that although I wanted to include all of the Africa bloggers who attended and blogged about TED Global 07′, I was not able to, and therefore apologize to anyone who was not included. Please feel free to expound on any omissions in the comments section below. Otherwise, this post has been great fun to write! And one final note, in case anyone one is wondering how this relates to the theme that I usually write about, which is enterprise in Sub-Saharan Africa, there is in fact a tremendous tie-in. To me, this event represents something that many of Africa's Sub-Saharan countries have been working tirelessly on for a long time: rebranding Africa's image. This essentially boils down to public relations and marketing. If people can connect with your story, or if they like the message. they are more likely to buy or invest in your products. 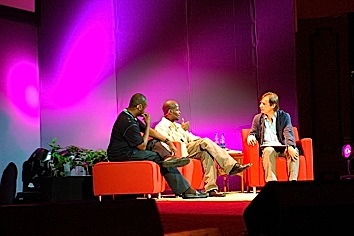 And TED 2007, as well as the bloggers in attendance, helped convey the message of hope and achievement on the continent. Amazingly, the event seems to have accomplished something that even US$100 million of public relations consulting would not have done for the continent. In a nutshell, this accomplishment has been the weaving together of a consistant, genuine, and believable story about the possibilty of Africa becoming the “next big thing”. That in a few short years, instead of the Asian Tiger economies, we might all be talking about Africa's roaring “lion economies”. And that is big. Thank for mentioning both my blogs Benjamin. The readers may be interested in viewing this short video podcast interview with George Ayittey. Man did I like how he packed the punches. Shooting straight from the hip and saying it as it is. This was my highlight for the conference. Global Voices’ Benin Mwangi has posted Africa: Blogging TED Global: Kenyan author Binyavanga Wainaina is also TED-blogging…. I am glad someone finally put it all together. Thanks Ben. Hi, no problem. I enjoy checking out both of your blogs. “Benjamin” I haven’t heard that one since my early childhood days. That put a smile on my face. Thanks for the podcast link too. Otherwise, keep on shining in all that you do! Thanks for introducing me to Wainaina’s blog! Hi, O. Man you were not joking when you said that you have a lot on your rss reader. I have seen your name in comments all over the place in the Africa blogosphere lately. You are on it! On this post, even though it was a round up, it has been my most challenging post-to date. But, I think it’s worth it, though. The world needs to wake up to the amazing things going on in Sub Saharan Africa, you know? And the conversation continues. Was one of the most amazing events I have ever been to. We have an online group that I set up because I sure as heck did not want to lose the power of conversation. Am going to invite you to it Benin. I really appreciate it, actually I am listening. This is good stuff! Man-wow you sound like a cnn journalist! This is really an excellent interview. Please do, I’d like that. By the way great job! Likewise, you are invited to the google group Africa Enterprising. Looking forward to more conversations. Pingback: Grandiose Parlor » Blog Archive » TEDGlobal 2007 Arusha Tanzania: And the Revolution was Blogged…Live!